Radiology Business Management Association to pursue new initiatives to serve members better. RBMA Board of Directors conducting their Strategic Planning Session. The RBMA has been a dynamic responsive organization for more than four decades. The drive to continuously improve is simply in our DNA. 1. Growing membership through enhancing the value of the RBMA. 2. 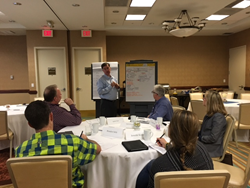 Restructuring the RBMA governance plan for more nimble, focused and empowered leadership. 3. Ensuring continued financial viability. 4. Improving RBMA’s high-value data service for the benefit of members and the association’s advocacy efforts. With assistance from an outside consultant, RBMA has made forward strides to enhance its value and create a campaign to attract more members. The new campaign, along with a substantial investment in outside marketing, will allow for increased visibility and a larger presence in the industry. Starting this year, RBMA plans to streamline the form, structure and leadership of RBMA board, committees and task forces in order to become a more nimble and effective organization. The RBMA will be taking a critical look at its bylaws, board policies, and processes to facilitate timely decision-making. In addition, committee and task forces will come in closer alignment with strategic relevance. Members will have greater flexibility in ways to volunteer. RBMA also set financial performance goals to ensure that the association manages its resources effectively. DataMAXX, RBMA’s online financial and operational performance benchmarking resource for members, continues to grow in participation and scope. RBMA has collected three years of accounts receivable (A/R) information and will soon begin collection of 2015 A/R data. DataMAXX’s Compensation Module has collected two years of salary and leave benefits information for radiology professionals. “The RBMA is here for the benefit of its members, and we want to make sure we reflect regularly on how we can maximize value for them and enable more members to become involved with leading their association,” says Michael Mabry, executive director of the RBMA. Last year, the RBMA launched its RBMA Washington Insider e-newsletter on political issues and began graduating its first RBMA U students. This year, plans include the addition of high-level executive education by high-profile speakers at conferences. RBMA members will be kept informed about organizational changes and new products from the RBMA through email, at national conferences and regional chapter meetings, and in the pages of the association’s monthly magazine, The RBMA Bulletin. Non-members can follow RBMA news on its website and through social media. The Radiology Business Management Association (RBMA) is a national not-for-profit association providing members with applied business information and intelligence applicable in any radiology setting. The RBMA has approximately 2,300 members involved in various management capacities in private practices, academic radiology groups, imaging centers and hospitals. The RBMA continues to be recognized as the leader for radiology-specific educational programs, products and services, publications and data.